Galena has been dominant this season in rolling to an 8-0 start. The Bulldogs feature a big offensive line and a talented backfield that is led by senior quarterback JC Shelton. Kooper Lawson and Nick Sarwinski also key the Galena backfield that lost standout fullback Joseph Helton to injury during the season. Blake Booth, Jacob Wheelen, MJ Jones, and Logan Henderson are all versatile athletes that can make plays on the offensive side of the ball. Anderson County won just twice during the season, but those victories were good enough to earn a fourth-place finish in District 2. Frontenac travels to Burlington in a good first-round match-up. The Raiders have posted another winning season despite taking a significant hit to graduation off of last year’s 4A-II state runner-up team. Frontenac posted two out-of-state victories early in the year, then split a pair of 1-point district games in beating Parsons (7-6) and losing to Caney Valley (21-20). Burlington has won two straight games since a surprising loss to Iola in district play. The absence of Brannon Nordstedt may have played a part in that. Since his return, Nordstedt has carried 59 times for 354 yards and five touchdowns the past two weeks. These two Wildcat rivals have traditionally met either in district play or deep in the playoffs. This season, Holton is just 3-5 after taking a heavy hit to graduation a year ago. The Wildcats have averaged 275 yards per game on the ground let by sophomore Konnor Tannahill’s 583 yards. They’ll have a difficult task in taking on a Hayden team that has only lost to 6A’s Washburn Rural and 5A’s Topeka Seaman. Brady Bohannon has played well at quarterback and Desmond Purnell looks to have a big post-season out of the backfield. The key is the Hayden offensive and defensive lines which returned some key players from last season’s state semifinal appearance. Marysville reached the state championship game last season and was on the verge of winning before an interception at the goal line secured a 7-6 win for Sabetha. The Bulldogs look to make noise in the playoffs again, but open with a consistent program in Santa Fe Trial. Junior Brandon Schroedl leads the Marysville offense with 1,274 passing yards and 14 touchdowns, while Atreyau Hornbeak has rushed for 526 yards and nine scores. Jacob Backus has produced another solid season catching the football with 44 receptions for 600 yards and seven scores. Santa Fe Trail won three straight games in order to qualify for the playoffs. The Chargers won at Wellsville, 22-8, then edged Jeff West, 33-29 to qualify as third in District 3. Senior Will Herren paces the Charger offense with 1,094 rush yards and 19 touchdowns. This should be one of the better first-round games. It’s been a difficult couple of weeks surrounding the Caney Valley program as Bullpup Jalen Bush was critically injured in a car accident the morning of the Bullpups’ homecoming game against Parsons. Caney also has battled through injuries to produce a six-win season. Trey Richey and Ben Nunneley have led the Bullpup offense and will need to play well on Caney’s trip to LaCygne. Prairie View is 7-1 under former Louisburg coach Kyle Littrell. The Buffaloes lone loss came to Galena, 50-22, back in Week 3. Junior Hunter Boone is the Buffs’ leading rusher with 737 yards and seven touchdowns. Parsons has enjoyed a break-out season under first-year coach Kurt Friess. The Vikings finished second in District 1 with losses to Frontenac (7-6) and Galena (52-14). Senior Gage Friess has passed for 1,477 yards and 20 touchdowns and rushed for 507 yards and five scores. Patrick Loadholtz is Parsons’ leading receiver with 31 catches for 624 yards and 8 scores. The Vikings are loaded with skill players including DaQuan Johnson, Dariq Williams, and Davonte’ Yates to name just a few. Girard has enjoyed a five-win season under coach Neal Philpot. The Trojans have lost to Galena, Burlington, and a narrow 14-6 loss to District 2 champion Prairie View. Defending 3A champion Sabetha has been dominant this season in running its win streak to 15 straight games. Junior Gabe Garber has played well in his first season at quarterback. Garber has passed for 584 yards and rushed for 676 more yards while producing 21 total touchdowns. Joe Gruber leads the rushing attack with 720 yards and eight scores. Jefferson West opened the season 4-0, but has since lost three of four. Sophomore quarterback Cade Ross passed for 1,122 yards and 20 touchdowns, but has been injured the past three games. Quinn Neuenswander has passed for 435 yards in his absence. Zeth Unruh and Joe Anderson each have 32 receptions, with Unruh’s catches going for 584 yards and Anderson’s 371. Perry-Lecompton spent several weeks in the 3A top five even after a two-point loss at defending 3A champion Sabetha. The Kaws then dropped a 20-0 decision in district play to Topeka Hayden in a game that as 6-0 for the better part of 3.5 quarters. Dalton Kellum is the Kaws do-it-all player with 1,142 rushing yards and 16 touchdowns. Kellum has also passed for 551 yards and six scores while splitting time with sophomore William Welch. Wamego has gone 5-3 under first-year coach Weston Moody. The Red Raiders earned the third-place spot in the district after a 41-34 victory over Holton last week. While Perry-Lecompton dropped a close 35-33 decision to Sabetha, the Red Raiders were shut out by the Blue Jays 56-0 two weeks ago. Smoky Valley is one of six undefeated teams left in 3A, though has been the only one that has not been ranked this year. Smoky Valley’s offense is well behind the other five perfect squads at 254 points but its defense has permitted just 63 points a contest, seventh-best in the classification, and on par with the undefeated quintet. Cheney has taken a seven-win decrease from last fall after the graduation of standout multi-year quarterback Micah Grover. The Cardinals have played multiple teams competitively, including giving No. 1-ranked Andale its closest contest of the year last week in a 35-13 defeat. Smoky Valley is known for its power running game with quarterback Lane Schrag, fullback Cord Elliott and running back Tim Lambert Jr., along with its senior-laden offensive line paced by Ethan Wampler. Smoky Valley has rushed for 327 yards a contest, including 1,015 from Lambert. Hesston opened the season as a top-5 team but went through some struggles after injuries to its all-state duo of quarterback Cameron Cox and running back Parker Roth. Both have returned in midseason. Hesston’s key is likely the play of its veteran offensive line, several whom started on the 3A state runner-up team two years ago. Collegiate has a one-win improvement over last fall. This is the first matchup between the teams since Collegiate captured a 61-35 victory in the 2014 playoffs. Hesston has not defeated the Spartans since the ’07 season opener, according to Kansas Football History. Pratt will be the substantial favorite over the Panthers. Pratt has enjoyed a huge year with a total margin of 360-45 and stands in the top-three in scoring offense and defense. Senior quarterback Travis Theis has led the team but Kadence Riner has posted big numbers, too. Pratt has already enjoyed a one-win improvement over last season after a surprising 7-2 mark where the Greenbacks missed the playoffs. Pratt has rushed for 341 yards a game. Theis has passed for 560 with an 8/0 TD/INT ratio. He has rushed for 1,382 yards and 23 scores. Riner has 640 yards and nine TDs and averaged 12.8 yards per carry, a tick higher than Theis’ 12.7. Riner paces the defense with 12 TFLs. Colby opened 6-0, its best start since 1990, before a competitive road loss to Scott City two weeks ago. The Eagles feature quarterback Jordan Schippers, one of the state’s top players, and have all-purpose threat Calvin Stapp and end Xavier Slaven. Colby has averaged 40 points a game, and along with Prairie View, is one of just two 7-1 teams in the classification. The Eagles have a one-win improvement over last fall and have bumped its win total for the sixth straight season. Colby, with second-year coach Rees McKinney, has its most wins since a 7-3 mark in 2009 and has not won more than seven in a season since before 2004. Kingman pulled a Week 9 upset against one-loss Pratt last season. Kingman is known for defense and have been solid with 26.1 points allowed a contest. Halstead has had a one-win improvement from last fall and has excellent special teams and running game. The Dragons could provide top-ranked Andale with its closest test this year. Andale has dominated its regular season schedule with a 398-33 margin. The Indians, led by tight end Mason Fairchild, rank first in 3A in offense and lead Kansas 11-man football in scoring defense. Halstead has scored 34 points a game and permitted just under 20. The Dragons have rushed for 299 yards a game. Junior Scott Grider has 154 carries for 1,286 yards and 21 rushing scores and has a punt return touchdown. Chapman has been one of the prevailing stories of 2018 for its five-win turnaround under second-year coach Kurt Webster. The Irish have its first winning season since 2007 and captured the North Central Kansas League crown, also for the first time since ‘07. Chapman has led with its dominant run attack that averages 307 rushing yards a game. Senior Dalton Harvey has 195 carries for 1,176 yards with 14 scores. Senior quarterback Izek Jackson has accounted for 13 scores in just six games. Senior Brandon Colston has 73 tackles. The Irish are 1-2 in the last three weeks with a tight loss to Smoky Valley, and then an overtime defeat to Halstead last week. Both games have been 30-22 margins. Clearwater has scored 201 points and allowed 229. Chapman has scored 231 and allowed 140. Nickerson has taken a five-win decrease with new coach John Wellman. The Panthers have multiple close losses, including to undefeated Smoky Valley and has permitted just 24.1 points per contest. However, the Panthers have tallied just 15.3 points a game. Scott City is the heavy favorite with its average margin of victory 45-8. Senior running back Wyatt Hayes, senior quarterback Parker Gooden, senior wide receiver Marshall Faurot and senior lineman Kyle Sherwood pace an experienced group. Hayes had 217 rushing yards, Gooden passed for 109 and Faurot tallied 69 receiving yards in last week’s win versus Concordia. Scott City is 8-0 for the seventh time in the last nine years. This is the first matchup since 2001, a 35-21 Beaver playoff win, in the Class 4A playoffs, according to Western Kansas News. Hugoton has enjoyed a one-win improvement with new coach Nick O’Loughlin, a former St. Francis assistant and Hugoton graduate. Hugoton opened 0-3 but is 4-1 since, including a nice 14-7 victory versus Holcomb last week. Holcomb was the defending Class 4A, Division II state champion and was eliminated from the playoffs. Hugoton scored the winning touchdown midway through the fourth quarter on a recovered fumble in the end zone off an offensive play. The Eagles’ defense stopped Holcomb at the five-yard line on another drive. Dawson Kerbow had 25 carries for 195 yards after he missed some time earlier in the season because of injury. Beloit will make a 267-mile trip to the southwest part of the state. The Trojans have faced injuries throughout the year, mainly to quarterback Hudson Gray. Senior Tate Ahlvers has 104 carries for 626 yards for eight scores. Humboldt has rolled to an unbeaten regular season and recently cracked the top five in the 2A poll. The Cubs have outscored opponents 461 to 44 this season, although the schedule hasn’t been great. Conor Haviland has rushed for 1,055 yards and 25 touchdowns while averaging a ridiculous 15.5 yards per carry. Quarterback Dagen Goodner has added 632 rushing yards and 13 scores, and passed for 703 yards and 12 touchdowns. Second-year coach Mike Einspahr has led West Franklin to its first-ever playoff appearance since the consolidation of Pomona and Williamsburg. The Falcons have a forfeit victory over Oskaloosa and three shutout victories over Northern Heights, Lyndon, and Central Heights. Southeast-Cherokee opened the season with a 20-6 victory over Uniontown. That was not only the school’s first game as a member of the Three Rivers League, but it also snapped a 28-game losing streak that had dated back to 2014. The Lancers are also back in the playoffs for the first time since 2010. Senior quarterback Bret Malle has more than 1,000 all-purpose yards, while sophomore back Zaden Hendricks has rushed for nearly 600 yards and a pair of scores. Osage City is led by its diminutive quarterback Trenton Plinsky. Plinsky (5-5, 130) has thrown for more than 1,000 yards and 21 touchdowns, and added 712 rushing yards and 11 more scores. Receivers Colton Prunty and Krimzyn Clark each have more than 300 receiving yards and have combined for 14 touchdowns. Mission Valley has maintained its consistency under first-year head coach Justin Duncan. Duncan took over for Jeff Savage who led the Vikings to a 6-4 record a year ago, then returned to the eight-man level at Doniphan West. The Vikings began the season with four wins, but have since dropped three of four as the competition stiffened. Senior Chole Phillips has rushed for 996 yards and eight touchdowns, while quarterback Trevor Moore had produced more than 1,000 total yards and 14 touchdowns. The Vikings will have to tend with one of the top quarterbacks in the classification in Maur Hill’s Jack Caudle. The junior lefty has passed for 1,466 yards and 18 touchdowns this season to push his career totals to 4,702 passing yards and 60 scores. 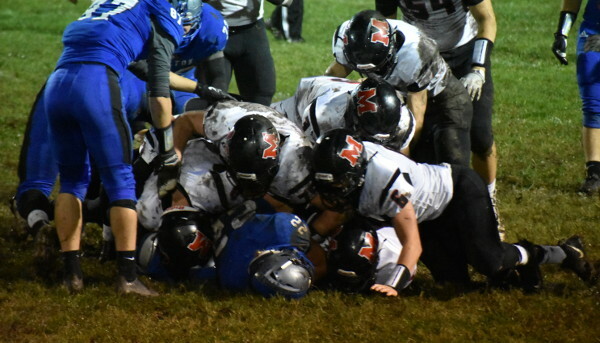 Four different players, including Caudle, have rushed for more than 225 yards for MH-MA. Senior Tate Vowles is the leading receiver with 30 catches for 752 yards and 10 scores. The Ravens picked up a season-defining win at Nemaha Central, 27-25, last week to claim the District 3 championship. Pleasant Ridge is a part of the bracket for a seventh consecutive season, but the Rams have a difficult task in a trip to Rossville. Pleasant Ridge’s three losses have come to good teams in Troy (18-0), Nemaha Central (29-28), and Maur Hill (38-22). The Rams are led by Colton Comer who has passed for 817 yards and nine touchdowns, and rushed for 774 more yards with 11 scores. Keaton Comer and Jamar Reed are the Rams top two receivers with over 330 yards each, and Clayton Richter is a nice target at tight end. Rossville is led by quarterback Garret Carver. Carver has rushed for 846 yards and 15 touchdowns, while passing for 1,029 yards and seven scores. This is first meeting between the two since the 2008 sub-state semifinal showdown won by Silver Lake, 43-12. Silver Lake has climbed to No. 2 in the Class 2A poll after another unbeaten regular season. The Eagles are led by senior quarterback Mason Griffin who has thrown for 1,249 yards and 14 touchdowns. Christian Stoner has added 846 rush yards and 12 scores in just six games. The Eagles have four receivers with double-digit receptions and more than 225 receiving yards. Riverton has struggled with numbers recently and produced a pair of wins over Northeast-Arma and Southeast-Cherokee. The Southeast victory got the Rams into the playoffs as Riverton won 22-8 on a wet, muddy field. After a winless season a year ago, McLouth is much improved in entering bracket play with an even 4-4 record under Gary Freeman. The Bulldogs have won three of four contests, including a 26-24 decision over West Franklin. McLouth has averaged more than 28 points per game, while giving up 28 as well. Jayhawk-Linn has produced a 23-5 record the past three season under Randy Leach. This year’s team was hit hard by graduation, but still produced a six-win regular season. The Jayhawks’ two losses have come to Pleasanton (36-12) and district-champion Humboldt (73-0). Riley County is expected to be a contender on the east side of Class 2A and spent some time ranked in the top five this season. The Falcons led Southeast of Saline 21-0 at halftime two weeks ago, but gave up 23 second-half points in an eventual 23-21 loss. Still the Falcon offense has been good let by standout senior back Mikey Waggoner’s 889 rush yards and 14 scores. Quarterback Garrett Harmision has played well in passing for 1,161 yards and 15 touchdowns. Riverside enters the bracket with just two wins over Atchison County and Horton. The Cyclones have given up 30 points per game this season, while scoring 22 points per contest. One of the more intriguing first-round matchups matches a much-improved Southeast of Saline team against traditional power Nemaha Central. SE Saline has a three-win improvement off last season, and as expected with a much more veteran defense, has limited teams to just 14.5 points a game. The Trojans have scored 26.8 points a contest with a passing game that has a 12/12 TD/INT ratio. Seniors Dylan Marks and Colby Beer have combined for 21 TFLs. Senior Nick Montgomery has picked off seven passes as the Trojans have forced 26 turnovers. Last fall, SE Saline scored 38 points a contest and permitted 31.1 a game. Nemaha Central opened the season ranked fourth and has averaged 38 points with just 21 allowed. SE Saline has not advanced past the first round of the playoffs since 2006. For Nemaha Central, senior Dalton Schmelzle has thrown for 1,138 yards with a 16/4 TD/INT ratio. The Thunder has forced 18 turnovers and thrown just four INTs as a team. Before this year, Nemaha Central had just three losses in the last three seasons. Douglass’ running back Zachary Dressler has tallied 1,623 rushing yards, best in 11-man football. Douglass is 7-1, a four-win improvement from last fall and the program’s first winning season in more than 14 years. Douglass has a total margin of 325-146, while Garden Plain has a total of 231-128. Douglass’ loss this year came against Garden Plain, a 31-0 defeat in Week 2. Garden Plain has won 14 straight in the series dating back to ’04. Belle Plains has had one of the more unique seasons of any 2018 squad. The Dragons have enjoyed its best record since its last winning season, a 5-4 mark in 2011, the team’s only above .500 year since ’07. Belle Plaine opened the year with a 37-36 overtime road loss to Inman. Then, the Dragons beat Neodesha in a 33-27 in a double-overtime home game, and two weeks ago, defeated Eureka, 27-26, in overtime. Additionally, Belle Plaine beat Cherryvale (41-40) and lost at Fredonia (28-23) also in close contests. Trinity Catholic has the No. 2 scoring defense with 63 total points allowed and features one of Kansas’ most complete players with quarterback Kaleb Hammeke. He has accounted for 13 total scores, while senior Aaron Guerrero has 686 rushing yards and eight TDs. Ellsworth has had a four-win decrease from last fall, and Cimarron has matched last season’s win total with seven straight victories. Ellsworth has taken multiple close losses of 11, two, one and 18 points against a pair of big wins. Cimarron has outscored teams 396-86 and stands second in offense and tied for fifth in defense. Despite being banged up for part of the year, sophomore Tate Seabolt has had his expected breakout season with 159 carries for 1,291 rushing yards and 15 scores. Senior Anthony Erives has stepped up with 72 carries for 732 yards and eight rushing scores. Cimarron has rushed for 373 yards a game. The Bluejays have five straight winning seasons and have captured seven victories in each of the last three falls. However, Cimarron has not captured more than seven wins in a season since before 2004. Hoisington missed standout running back Wyatt Pedigo in a season-opening loss to Pratt and is 6-1 since with its only defeat a big loss to top-ranked Phillipsburg. Pedigo is one of the state’s leading rushers with 138 carries for 1,527 yards and 22 rushing scores. He also has 64 stops with eight TFLs. Hoisington has outscored teams, 279-159. Sterling has tallied 200 points but has permitted 304. This is the first matchup between the teams since 2015, a 56-0 Hoisington victory. In ’14, the Cardinals beat Sterling, 42-0. Before then, Sterling won 14-8 in ’11. Hoisington holds an 8-2 advantage in the last 10 meetings. Great credit to Eureka coach Jason Nichols and its program for winning three games despite a full slate of road games due to a tornado that hit the town this summer and caused damage to the football stadium. Conway Springs has been tested in several games and actually outgained in key wins versus Hutchinson Trinity and rival Garden Plain but has enjoyed an excellent turnover margin and a big running game paced by quarterback Collin Koester and running back Peyton Winter. Two weeks ago, in a big win versus Chaparral, Winter had 167 rushing yards and two scores, and Koester rushed for 123 yards and accounted for four total TDs. Conway Springs is fourth in scoring at 347 points and has permitted 107. Eureka has tallied 111 and allowed 183. These teams have not played in more than 14 years. Last week, Fredonia took a big upset loss, 35-20, at rival Neodesha, a team that entered the game without a victory. The Yellow Jackets (5-3) have a two-win improvement off last season with three wins by a combined 19 points, including a pair of 7-0 victories. Despite the winning record, Fredonia has been outscored by six total points this fall. Chaparral has posted a big offensive year but has lost in the last two weeks to Conway Springs and Hutchinson Trinity. Conway Springs pulled away in the second half behind a big running game, while Trinity needed a late score for the final margin. Chaparral has tallied 325 points, which ranks in the top-10 in the classification, but has permitted 180, the most points by any 2A team with zero, one or two defeats. Senior quarterback Jake Burke has passed for 1,152 yards with an 18/7 TD/INT ratio. He leads the team with 785 rushing yards and 13 scores. Senior Quinton Pfaff has 34 catches for 575 yards and seven TDs. This is a rare matchup between the squads, first since at least before 2004. Phillipsburg is the heavy favorite as Southwestern Heights makes the 237-mile trek north. The Panthers have rolled over everyone, including Smith Center, Plainville and Hoisington, teams that have a combined two losses when they don’t play Phillipsburg. The Panthers have a total margin of 386-79 and stand in the top-3 in both scoring offense and defense. Phillipsburg has four-year senior starting quarterback Trey Sides, senior running back Treylan Gross, and senior kicker Jonathan Hunnacutt, the all-time career kick scoring points leader in state history. For SW Heights, senior quarterback Efren Mercado has 161 carries for 1,039 yards and nine rushing scores. As a team, the Mustangs have a 5/10 TD/INT ratio. Like many first-round games, this is a rare matchup between the teams. These two teams have matched up twice in recent history with Norton winning in ’08 (21-0) and ’09 (62-22). However, this time, Lakin is the host school and a favorite. The Broncs have outscored teams 261-86, while Norton has tallied 185 points and allowed 224. Lakin is tied for fifth in 2A in scoring defense. Junior Kayden Christiansen has 124 carries for 857 yards and 12 TDs. Lakin is minus-2 in turnover margin but has benefited from nice seasons from standout lineman Hadley Panzer (52 tackles, team-high 5.5 TFLs) and senior Logan Gugelmeyer (Bronc-best 55 stops). Lakin is 15-4 in the last two years. Norton’s Kade Melvin has had a solid season in replacing quarterback Jace Ruder, a North Carolina commit, and end Hayden Wiltfong has an offer from Emporia State University. Melvin has tallied more than 1,500 total yards.